Boxeur Des Rues. Literately "street fighting boxer". 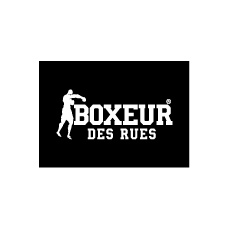 "Boxeur Des Rues" is a brand taking its inspiration from savate, the French boxing that combines elements of the western boxing with the martial arts imported (at the beginning of the 19th century) by the French sailors from the Far East and Asian ports. These techniques were developed in a fighting style used mainly in street brawls. Later, the "savate" moved into underground fight clubs around the dockyards of the most important and toughest port of France, Marseille. As consequence of the huge level of betting, both written and unwritten fighting rules were defined. From that the name "Boxeur Des Rues": true sportsmen, but born and living on the streets. Therefore, the brand essence is the fusion of "streetwear" and "sportswear".